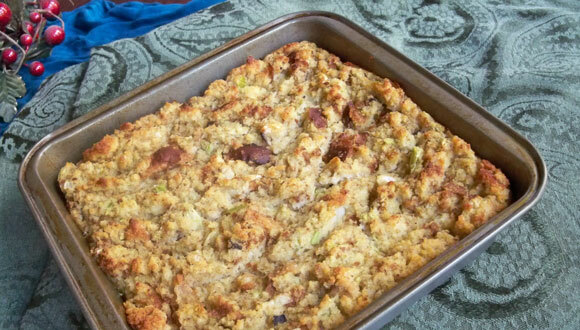 Terrific moist cornbread dressing, perfect for Thanksgiving. In a large bowl crumble white corn bread and toast slices. Saute celery and onion in a little butter until tender; add to bowl along with egg, mushroom soup, celery soup, poultry seasoning or sage, and salt and pepper. Pour in chicken broth and mix well. Bake in greased 9x13 inch pan at 400° for about an hour or until set in the middle. I look forward to this every Thanksgiving; will even eat it hot or cold or with gravy or without or however it’s available. Love it!